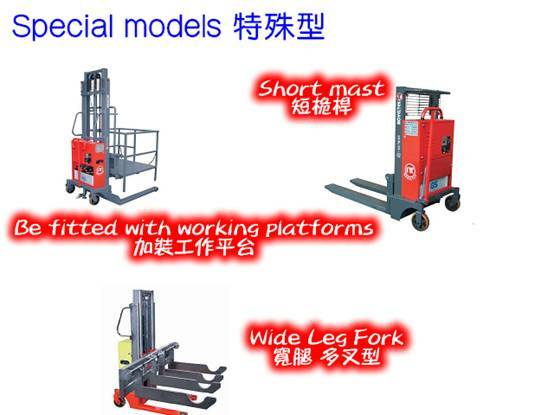 Powered Pallet Stacker(Load:1 Ton/1.2 Tons/1.5 Tons )SPS-10/12/15(SPS-10/10W) - Noveltek Industrial Manufacturing Inc.
◆ SPS-10 provides an electric powered hydraulic lifting, manually-propelled and load capacity 1000kg(2200lb), fork length 900mm(35.43"), adjustable width, lifting height 2500mm(98.4") or 3000mm(118") or 3500mm(137.8"). 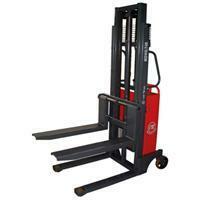 ◆ In addition, SPS -10W wide straddle version type is used for closed pallets. It has fork wheel 80mm(3.15") or 180mm(7.09") diameters for your choice and the straddle inner width will be 1240mm,1140mm, etc..
◆ Distance of straddle outer width has option 530mm for European pallets.